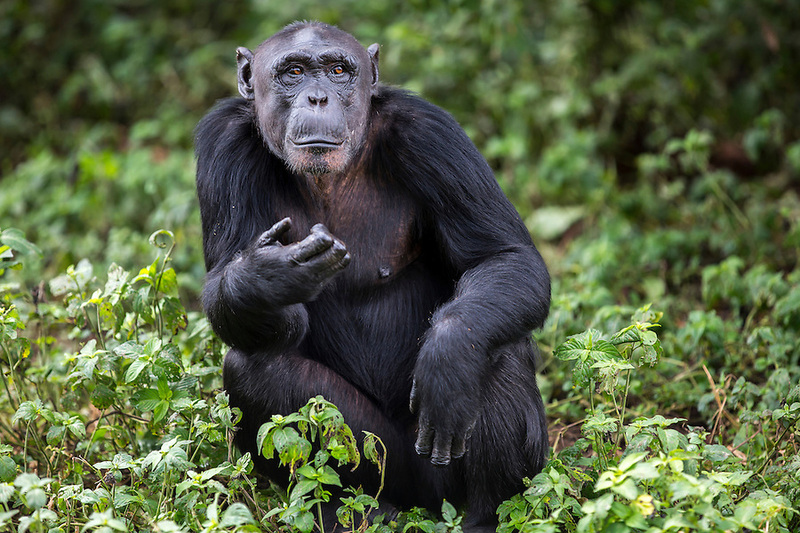 Female chimp, Ndyakira, is photographed at the Ngamba Island Chimpanzee Sanctuary in Lake Victoria, Uganda. Ndyakira, who has been on Ngamba Island since 2002, has a bald forehead and little hair around her face. Ndyakira means’ I will survive’ in Rutoro. She was named after a very famous environmental journalist in Uganda who helped in uncovering the story of the four chimps that traveled to Russia and eventually to Uganda (some of whom are now at Ngamba). Ndyakira was confiscated from dealers in Kampala. After being informed that someone was trying to sell an infant chimp, CSWCT with the assistance of the Wildlife Authority, arranged a sting operation and successfully rescued Ndyakira.